South Africa’s Waterford Estate is sited in the beautiful Blaauwklippen Valley of Stellenbosch. Only half of the sprawling 120 hectares of land is planted to vines: the rest is dedicated to preserving the natural fauna and flora of the estate. That’s the philosophy of the Ord Family, co-owners of Waterford, and of the other partner in the business, and a vital one, estate manager and cellarmaster Kevin Arnold. Established in 1998, Waterford was initially Kevin’s dream. A highly experienced winemaker and leading figure in South African winemaking, Kevin had spent the previous 30 years as winemaker at Delheim and Rust en Vrede, as well as a stint at Mondavi in California. Determined to establish his own estate to make the highest quality wine, his reputation and ambition attracted Jeremy Ord, an industrialist who had made his fortune in high-tec in Johannesburg. 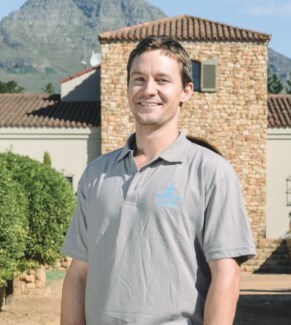 That sealed the partnership of the new business, where Mark le Roux (pictured) is now in day to day charge of winemaking. I met up with Mark when he paid a flying visit to Scotland, for a tasting of the estate’s wines. Since joining Mark has seen the ‘parcelisation’ of the vineyards as a priority: getting to know each block more intimately in order to coax the best from the soils and varieties planted there, even on a row to row basis. But not all the attention is in the vineyards, Mark explaining that they have a ‘Library collection’, essentially a Research & Development programme trialing cement tanks, different winemaking techniques, and producing small batches of wine each year – some only 500 bottles, but with the potential to become mainstream if successful. The first release will be a varietal Grenache. (2017) Also with 4% Chardonnay and 2% Viognier in the blend, the fruit sourced from Stellenbosch and Swartland. A fairly deep colour, delicious oatmeal touches, buttery notes, but the freshness and zest comes through. Juicy, textured with a hint of oiliness, but a nice savoury character and finish. (2017) A strict selection of Elgin’s best quality vineyards. From fertile chalky soils. A nice medium style, aromatic with some exotic fruit, a little squeeze of lemon and a lovely crisp palate, lots of juicy, quite exotic lychee and mango, but the dry pear fruit and touches of chalky mineral acidity add another dimension. Also bottled extensively in 50cl. (2017) This wine spends eight months in barrel, but only one quarter new and a mix of 228L, 300L, and 500L French oak. Planted in 1988, one of the oldest Chardonnay blocks in the Cape and unirrigated, on red clay and granite. Very old Burgundy clone. Lovely nose, creamy and oatmeally, a touch of buttery Brazil nut, then very elegant fruit. The palate has delicious slippery texture, nice orange and nutty Cox's fruit, good acidity, again a hint of chalky dryness. (2017) Cabernet Sauvignon, with 6% Petit Verdot, 4% Merlot aged 18 months in 225L French oak barrels, 34% of which were new. A lot of the Cabernet is on rocky sandstone and gravel with good root systems that end in clay to retain some water. Delightful nose, cherry and violet, real perfume, a touch of cedar and clove into deeper black fruit. The palate has lots of fruit but textured, layered, with so much spice and savoury character, finishing tight and grippy, just the right sense of plushness from ripe fruit and creaminess to give lovely harmony. (2017) Stellenbosch vineyards, but not the home estate. Each vintage of this wine is dedicated to one of the family's children, in this case, Ashleigh Anne. A blend of 88% Shiraz, 8% Grenache, 4% Mourvèdre aged 20 months in 225L and 500L French oak barrels. Recipe has changed from new American oak in the early days, to now only old French barrels. The Mourvèdre replaces some of the spice and tannin that would have come from the newer oak. Dry and quite earthy and severe in style, with some creaminess of berries and juiciness. Nice bit of peppery grip months finish. (2017) Only 56 barrels are produced of this all-encompassing blend of 45% Cabernet Sauvignon, 15% Shiraz, 11% Merlot, 6% Mourvèdre, 14% Cabernet franc, 4% Petit Verdot, 3% Barbera, and 2% Sangiovese. It spends 21 Months in 225L French oak barrels, 25% new. Initially the idea had been to make only one estate wine: this one. Mark says "It's a real South African blend," showcasing their best varieties and a unique blend. Reserved compared to the Cabernet, dense and plush with tight spices and a smooth but leathery firmness. The palate has a delicious hint of umami flavour, a touch of Parma ham, lots of black berries, spices and then good acidity to give a firm, lightly cedary, age-worthy wine.